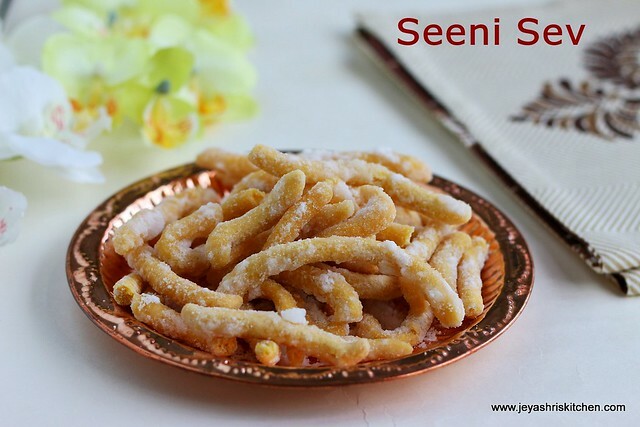 Sweet Sev| Inippu Sev| Cheeni sev, is a popular sweet in South of Tamilnadu. Grown up in madurai, i have traveled to nearby places during my childhood days. 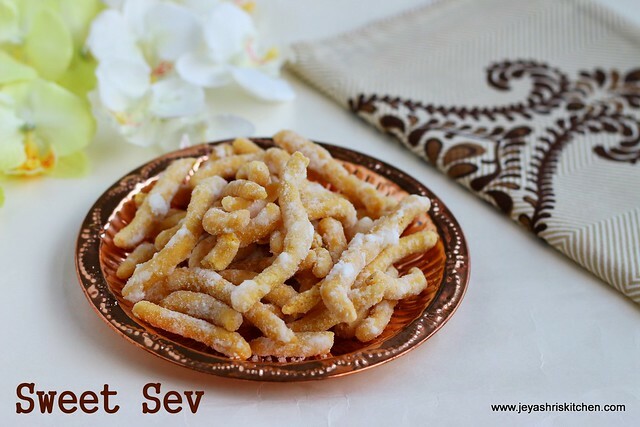 This Sweet Sev is quite popular in Sattur, Kovilpatti and Tirunelveli town. I remember seeing this in most of the sweet shops in the bus stand selling this inippu sev. During my childhood days, i hate eating sweets. So my dad will buy karasev for me and this Sweet sev for my sister who is a big lover of sweets. But after marriage i slowly developed sweet tooth and now i eat all varieties of sweet. When i was talking to my sister 2 days back, she asked me about my Diwali plans for Jeyashri's Kitchen. She too suggested me few recipes and this Inippu sev topped the list. Though she gave me a brief description of the recipe, i googled for my satisfaction and got a more clear picture from here. I tried this yesterday and it turned out very well. Everyone at home loved it very much. This Sev will not be crispy as we are dipping the fried sev in the sugar syrup. The soft sev with sugar coated on it will be a very tasty. 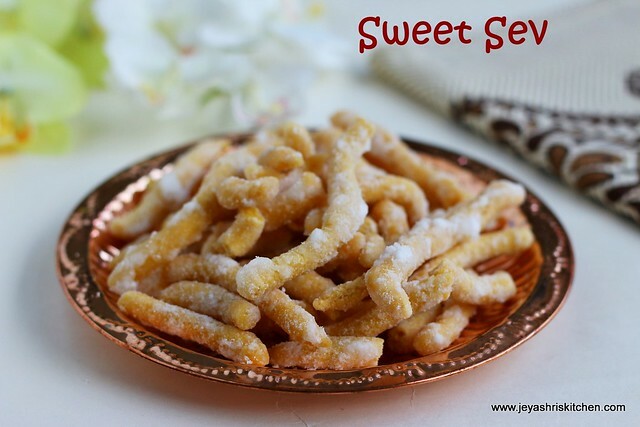 Bookmark this recipe for Diwali and check out my other Diwali sweet recipes too. A similar sweet with jaggery also we make which is called manoharam, which i have posted already . In a wide bowl add the besan and rice flour. You can use store bought rice flour too. Add a pinch of salt and 1 tblsp of hot oil to this. Add little water and make it into a soft dough. Put a portion of dough inside the murukku press. If making in big batches mix the dough in parts. Always keep the dough covered. I used the the achu which is similar to the thenkuzhal achu. You can use the thenkuzhal achu too. Heat the oil for deep frying. Squeeze the sev in the hot oil . Fry till the oil sound subsides. Drain this in a kitchen towel. Keep this aside. In a pan add the sugar and add the water. Let the sugar dissolve and keep the flame in medium low. In a small bowl keep water to check the sugar syrup consistency. Dissolve little sugar syrup in the water and if you could make a small ball out of it, the consistency is right. Once it is reached simmer the flame and add the fried sev to the sugar syrup. Gently mix it well so that the sugar syrup get coated with all the sev. Switch off the flame. Let be cool. Keep it covered and after 15 minutes if you see all the sev will be nicely coated with the sugar on the top. Gently with your hands or a ladle take out each one separately. This sev can be stored in airtight containers. This stays good for a week. Do not use wet hands while taking this sev. This sev will not be crisp as kara sev. Since we are dipping in sugar syrup it will be chewy only. Always ensure you get soft ball consistency of sugar syrup before adding the fried sev. If you want you can add a pinch of cardamom powder to the sugar syrup before adding the sev. You can reduce the sugar to 1/2 cup too if you want but ensure that the sev is fully coated with sugar syrup. hi jeyashri. ..I am a big fan of this sweet..thanks for posting such an easy recipe. ..will definitely try it out and share the feedback. .just wanted to clarify if the rice flour is the normal rice flour bought from shops or should it be the processed one which we make at home for bakshanams/kozhukattai.. Thanks subashini. You can use any rice flour. Both will work out fine. I have mentioned this in the post too.